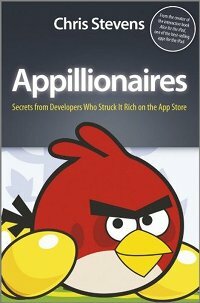 Appillionaires is a new book by Chris Stevens about the mobile apps gold rush. I received my copy from Amazon yesterday and within a day I’d finished it, which, if nothing else, is testament to its readability. Stevens’ credibility on this topic comes from his first-hand experience as a successful publisher of interactive books for the iPad. Early in the book he draws on this experience to articulate the seductive appeal of a new world of possibilities for independent software developers. Overnight we were a global sensation – newspapers and blogs all over the world were hailing us as the future of publishing. Watching the money roll in and the download statistics rise became a minor obsession. There’s something wildly captivating about viewing your successes through the microscope of modern analytic software. Second by second, hour by hour. It provides the kind of statistic fetishism where viewing download graphs by geographical region or time of day becomes an opportunity to self-indulgently wallow in your accomplishment. Appillionaires focuses exclusively on the iTunes App Store and the iOS platform. The Android Market is mentioned only in passing and other stores not at all. This doesn’t detract from the book though as, in terms of paid app sales, the iTunes App Store is still a long way ahead of the competition and it’s not an unreasonable assumption that successful strategies there will translate to other similar platforms. The first third of the book reviews how we got to where we are today. The Apple worship is kept to a minimum and the company’s missteps in the mobile phone market are covered along with its successes. In particular, and in contrast to recent revisionist histories, Stevens doesn’t gloss over the failure of the first iTunes phone, the Motorola Rokr. He also reminds us that third-party apps were not part of the original iPhone offering. Steve Jobs was apparently reluctant to open up the platform to outside developers and at first it was only through the reverse engineering efforts of the jailbreak community that programmers were able to target the device. Following the history lesson, the meat of the book is the five case studies of independent developers who have earned serious amounts of money from the App Store. As you work your way through these chapters it becomes clear that the book isn’t really about mobile apps, it’s about iPhone games. This is my one major criticism of Appillionaires. Games are a huge part of the mobile app revolution but they are arguably the least interesting part. The book gives honourable mentions to a couple of novelty entertainment apps (iBeer and Pull My Finger) but there is no space devoted to productivity apps, or location-aware apps, or any of the tens of thousands of actually useful apps that are making things just a little bit more convenient for millions of people every day. If just one of the gaming case studies had been dropped in favour of something from some other part of the App Store it would have presented a more complete picture. Developers of successful apps have usually released several largely unsuccessful apps before they hit on the winning formula. Successful apps rarely become successful straight away. Sometimes they go through several versions, refining the formula until it starts to gain traction with app buyers. Successful developers pay attention to small details and don’t settle for “good enough”. Successful iPhone games use control systems that are well adapted to the platform, with intuitive touch gestures. The final section of the book is devoted to business considerations. Stevens discusses how independent game developers are competing with, and being acquired by, the likes of EA, how the vast majority of developers are losing money on app development, and the threat of patent trolls such as Lodsys. This section aims to disabuse the reader of the notion that the Appillionaire outcome is common or even likely. Throughout the book it is made clear that luck plays a large part in which apps become successful. Also, through the choice of examples from the frontier days of the iPhone platform, Stevens gives an impression that, aside from talent and hard work, success was also partly due to being in the right place at the right time and that that time may already have passed. This is a book that is grounded in reality. The success stories are enticing but the app developer path is frequently portrayed as a form of gambling with many more losers than winners. The gambling analogy is apt. In most forms of gambling if you look beyond the players you’ll find that the real winner is the house. The genius of Apple’s ecosystem is that developers have been convinced to play cards in a poker room with a 30% rake.